Since the founding of our company, ScoreVision’s goal has always been to bring the high-energy fan experience of college and professional arenas to high schools across the country. In addition to providing amazing experiences to fans, we strive to make student-athletes feel like pro athletes through our scorekeeping and event production software. And our hard work is paying off. Hear it from the mom of a student at a ScoreVision school: “I think it shows that Charles City is serious about giving the kids the best experience to prepare them for their future. It’s more of a college experience at the high school level,” said Kim Schlader, Charles City High School alumna and parent. With ScoreVision’s scorekeeping and event production software, it’s now easier than ever to make players feel like pro athletes. Check out some of the features that inspire and motivate athletes! One of the most unique features of our scorekeeping software is the player accolade feature. When points or other accomplishments are assigned to a player during a game, the scorekeeper is prompted to show a player accolade. With one tap of a button, a photo of the player along with their name and jersey number bursts across the display. See it in action below! 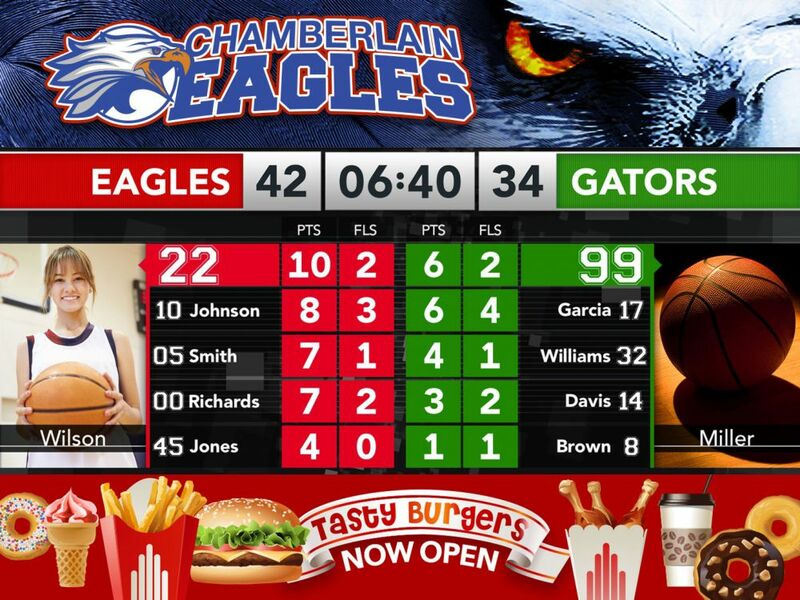 While fixed-digit leaderboards and statboards are becoming more common today, ScoreVision’s leaderboard feature provides a more dynamic approach, featuring player photos and additional information like points, fouls, and other stats associated with that player. The leaderboard can also be accessed by fans that can’t attend the game in-person via the ScoreVision Fan App. “Before our starting lineup, we play a 45-second clip of highlights from the year, with a couple dunks and a couple 3-point baskets and it just gets our kids really amped up,” says Ben Klapperich, head boys basketball coach at Charles City High School. Hype videos are short videos that get athletes fired up and make fans excited about the game. Also called walk-out videos or tunnel-walk videos, these clips are commonly produced by video production students at many ScoreVision schools. They can also be professionally developed by media agencies or by ScoreVision’s own Professional Creative Services. Check out one example of a hype video produced by students at Dublin High School! Player profiles are a popular way to announce the starting line-up before games with animated, personalized clips that showcase each player’s name, photo, and any additional information or stats. Watch all four of these player recognition features in action and see how they are impacting students in our short video below! Interested in learning more? Check out last week’s blog post about using ScoreVision jumbotrons for graduation ceremonies and stay tuned for next week’s post! Learn how you can bring ScoreVision to your school or facility by contacting us today!